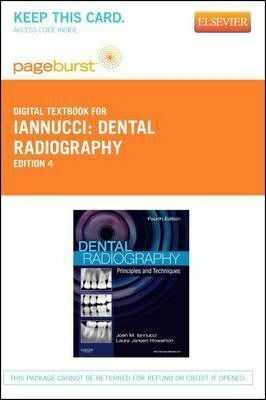 This is a Pageburst digital textbook; Providing essential coverage of dental radiography principles and complete technical instruction,Dental Radiography: Principles and Techniques, 4th Edition, is your key to the safe, effective use of radiation in the dental office. The first ever full-color dental radiography resource, this combination of a textbook and a training manual guides you step-by-step through common procedures, with accompanying illustrations, case studies, and interactive exercises to help you apply what you've learned to practice. Helpful Hints detail common problems you may encounter in practice and provide a checklist to guide you through thedo's and don'ts of imaging procedures. Key terms, learning objectives, and chapter summaries highlight essential information to help you study more efficiently.Interactive exercises, terminology games, and case studies modeled on the National Board Dental Hygiene Examination (NBDHE) on Evolve reinforce your understanding and help you prepare for examinations. UNIQUE! Full-color design and new illustrations and photographs clarify difficult concepts and help you master proper positioning techniques.UNIQUE! A comprehensive appendix provides quick, easy access to all mathematical formulas used in dental radiography.